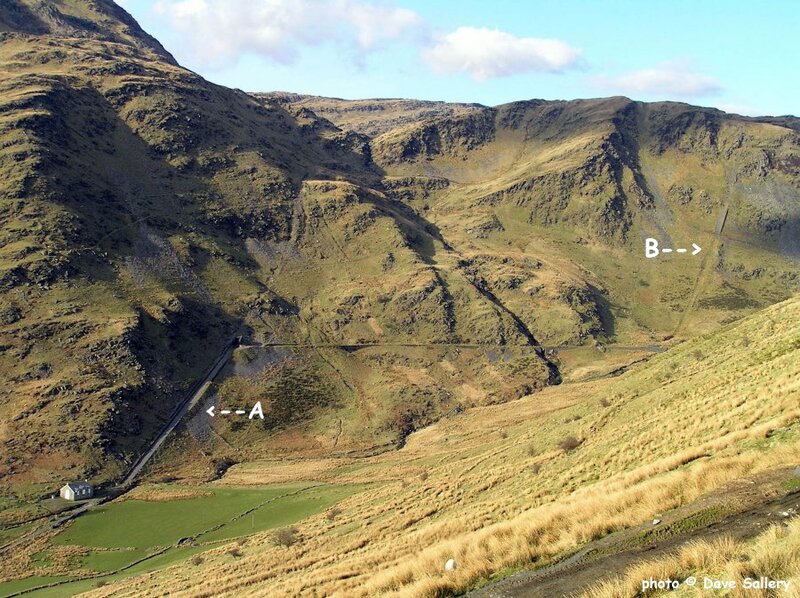 Blaen y Cwm (A) and Rhosydd (B) inclines on the route of the Croesor Tramway in Gwynedd. 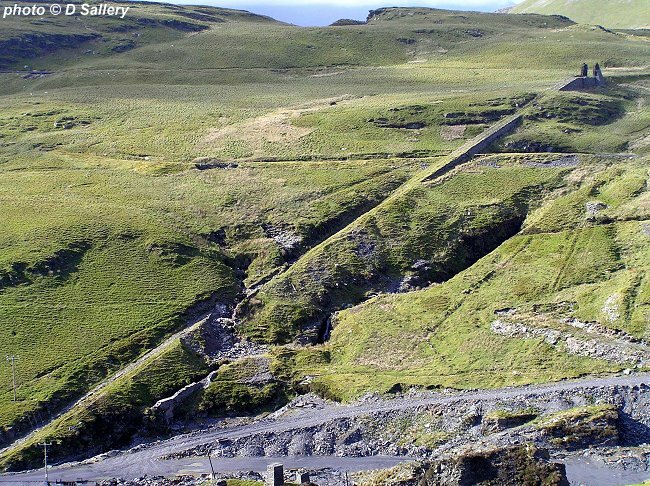 The slate industry would not have been able to develop without the humble tramway, it provided cheap and efficient transport when the only alternative was horse drawn carts - often over appalling roads. Likewise to enable the tramways to function in the mountainous areas a system was required to rapidly overcome the sudden changes in height. The inclined plane was the means of achieving this. At its simplest it was a steeply sloped double tracked formation with the two ropes around a drum at the top. One of the ropes was attached to a rake of loaded wagons at the top of the plane and the other rope fastened to a line of empty wagons at the bottom. By skilful use of the brake on the drum the loaded wagons going down hauled up the empty wagons - the two rakes passing halfway. However this method was only practicable for descending loaded wagons. Another variation on the theme was the sheave incline where a single wire rope was passed around a sheave at the top and each end of the rope was connected directly to a wagon. Uphaulage single tracked and powered, used for hauling up from a pit and extensively underground. Table where the trucks were pushed onto a horizontal table, often these table inclines were of a wider track gauge. Water balance using the weight of a tank of water as a counterbalance. Chain incline using wire or chain instead of rails, used to access deep pits. At the zenith of the industry there were over 500 gravity balanced inclines in operation. 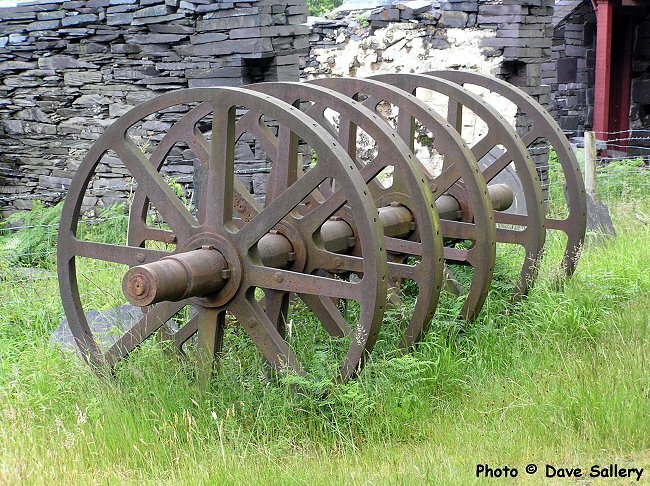 The last was taken out of use in 1976 at Maenofferen Quarry, Blaenau Ffestiniog. 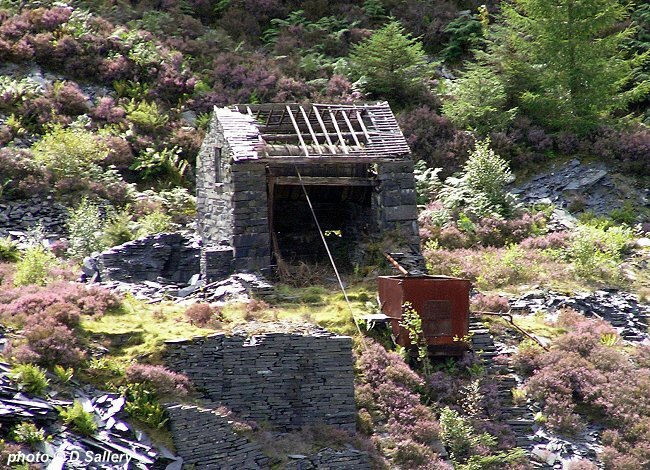 The drumhouse shown above worked the very last gravity incline to operate in North Wales. 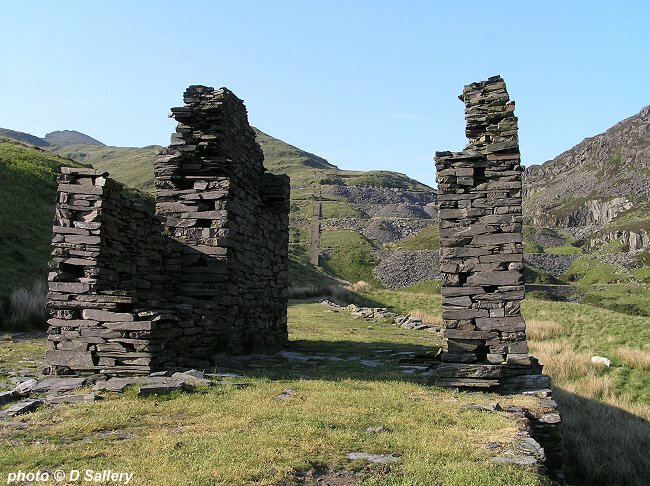 Wagons of roofing slates were worked, or crewled, from Maenofferen Quarry in Blaenau Ffestiniog down this incline to a lower level for onward transport by road vehicle. The incline closed in 1976 but is still reasonably intact except for the roof. On the drum are the two ropes - one wound over and the other under for the two tramway tracks. On the left of the drum is the strap brake which is worked by the long brake handle. Being an incline brakesman was a skilled and responsible job. Rhiwbach No.3 incline, near Blaenau Ffestiniog. 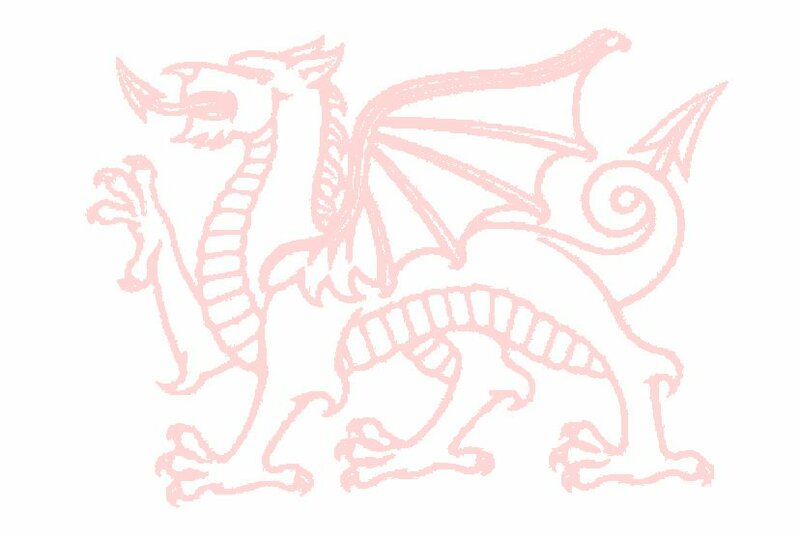 A view of Rhiwbach No. 3 incline. A classic balanced double acting incline. At the top may be seen the supporting walls of the now collapsed drumhead around which the two ropes were wound. Inclines of this length only became practicable after the invention of steel wire reinforced ropes. A similar length using hessian ropes would have required two or three separate inclines. 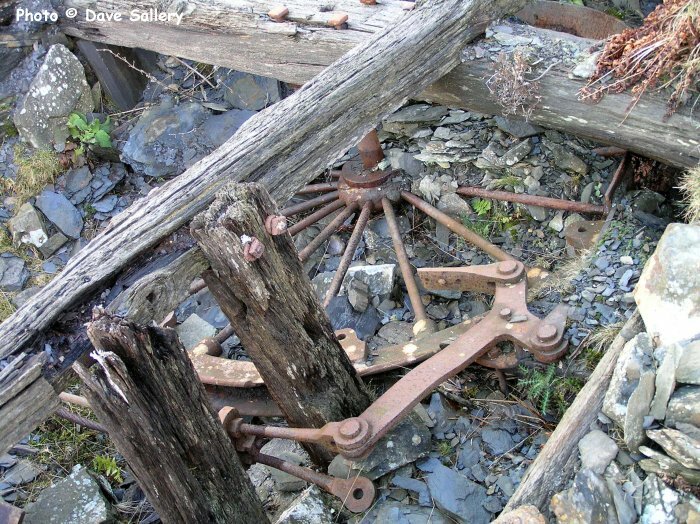 An example of a sheave incline showing the sheave wheel at the top of the incline. 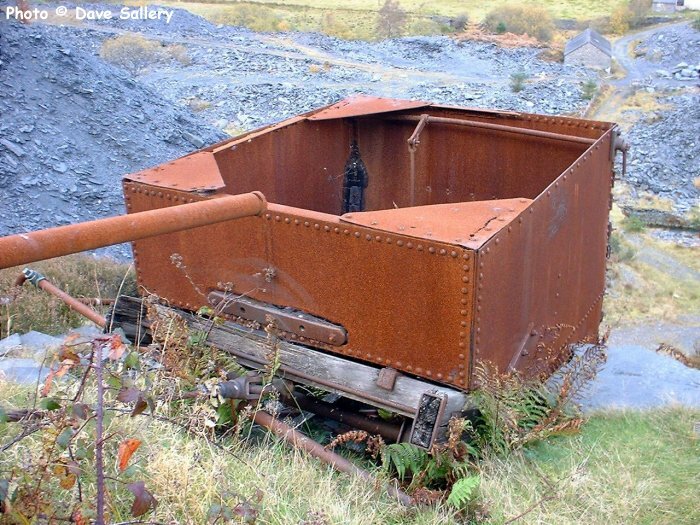 This incline is at Penarth Quarry near Corwen, Denbighshire. The partially dismantled brake equipment for the wheel. The brake was worked remotely by a long lever operated from 20 feet/6 metres lower down. 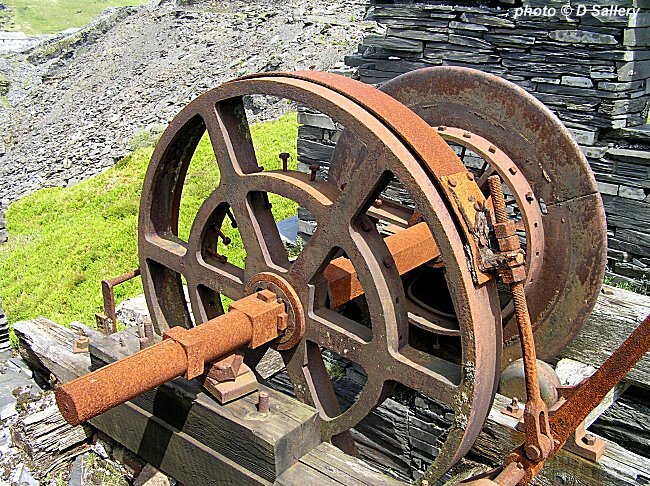 A sheave incline wheel at Dinorwic. The band brake can be seen below the wheel. 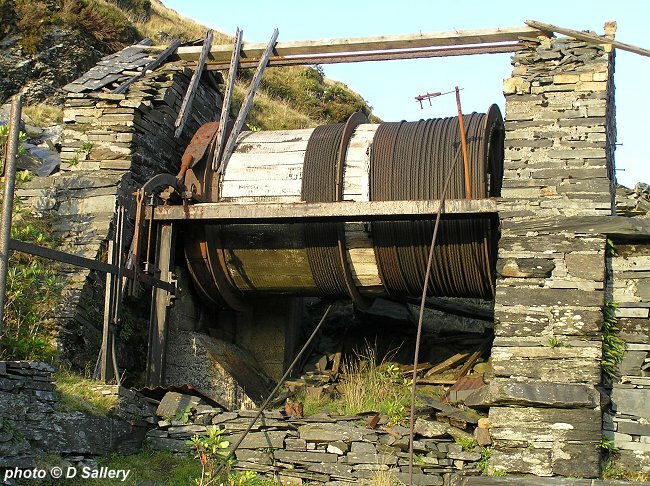 This incline was used to haul slate from underground. Power was provided by a nearby steam engine. The principle of table inclines was that the narrow gauge wagons were carried on a horizontal platform. The track on these inclines was of a wider gauge and the platform allowed up to 2 wagons to be carried at once. 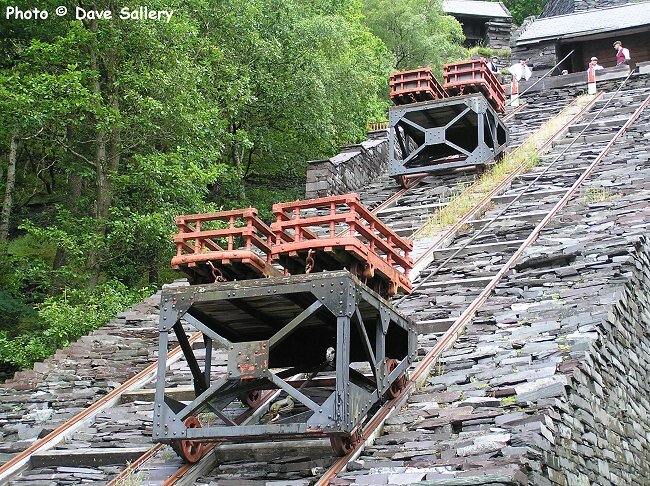 The photograph above shows the restored Dinorwic table incline, at the National Slate Museum in Llanberis, more photos of the incline in action here. This incline is now electrically powered but originally was worked by gravity. Below can be seen the arrangement of the rails on top of the table on a disused example. The preserved Water Balance at Penrhyn Quarry, Bethesda. The two movable platforms of the incline had tanks for water beneath. An empty wagon with a full tank of water would haul up a loaded wagon with its water tank empty. The raised tank on the right contained water which was used to supply the tanks under the platforms. Penrhyn at one time had eight of these balances and this one was named Sebastopol, as it was built during the Crimean War. 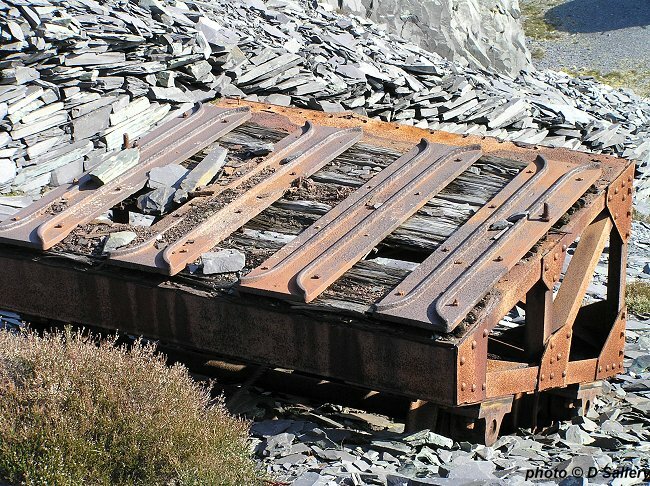 Photograph obtained with the permission of Alfred Macalpine Slate Ltd.
As Aberllefenni Quarry near Corris developed over the years it began to run out of tipping space for waste rock. The solution was to tip higher up on the other side of the valley. To raise the waste rock several water balances, like this one, were constructed. The tank is mounted on a wheeled chassis and when a wagon of waste rock needed to be raised the tank was filled with water, the tank was then lowered down the incline so raising the other wagon. At the bottom the water was let out and the wagon was returned to the top. 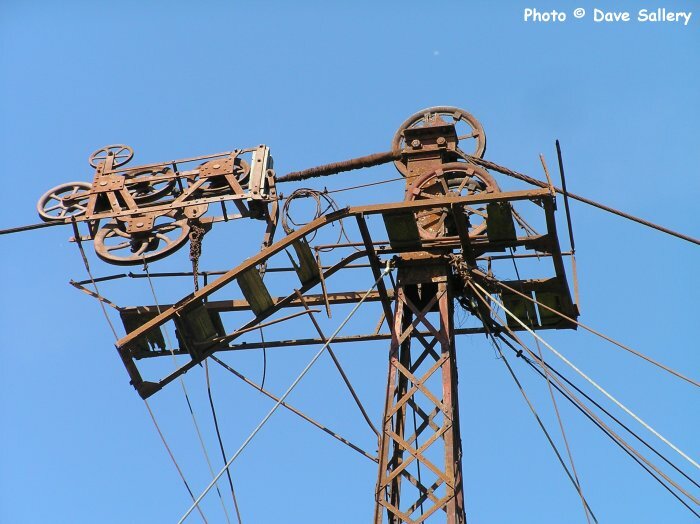 Aerial ropeways or Blondins were widely used in the industry and had the advantage over fixed inclines of being portable. 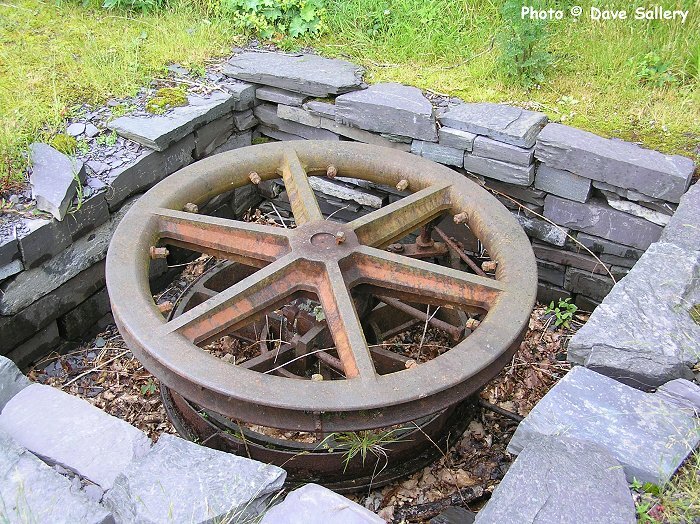 They were particularly used in the Nantlle area to access the deep pit workings. The Blondin consisted of a number of cables strung across the working area. When the wagon was attached, the cable was hauled out until it was above the working area, the wagon was then lowered to the bottom of the quarry. 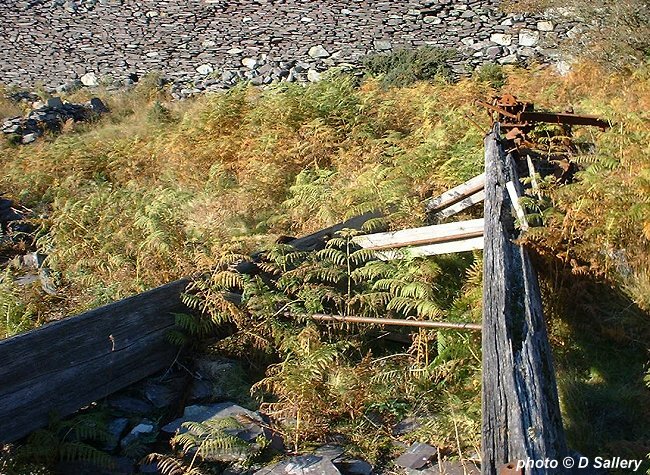 The last working examples were in use until 1979 at Pen yr Orsedd Quarry, Nantlle. The top photo is taken in Dinorwic while the bottom shows a Pen yr Orsedd cradle. There are noticeable differences between the two types. The end tower and cradle of a Pen yr Orsedd blondin. 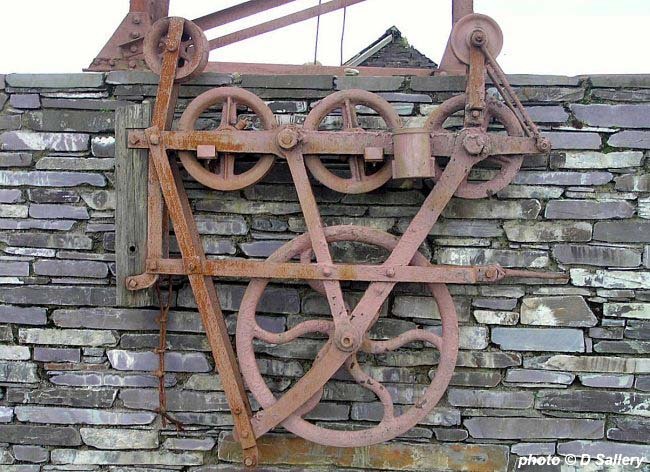 This simple system enabled slate quarried at a higher level to be lowered down to a dressing shed. At the top is the wheel for the wire rope while at the bottom is another wheel on which the strap brake acted. The slate blocks would travel on cradles suspended from the wire rope. This view shows how the long central gravity incline in the background could serve several different levels of a quarry. The drumhouse in the foreground let wagons down to the dressing area. 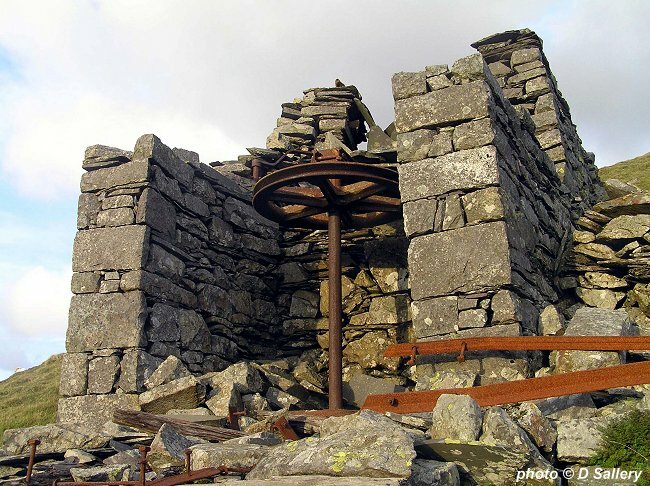 This is the collapsed tower of an aerial ropeway in Dyffryn Nantlle. 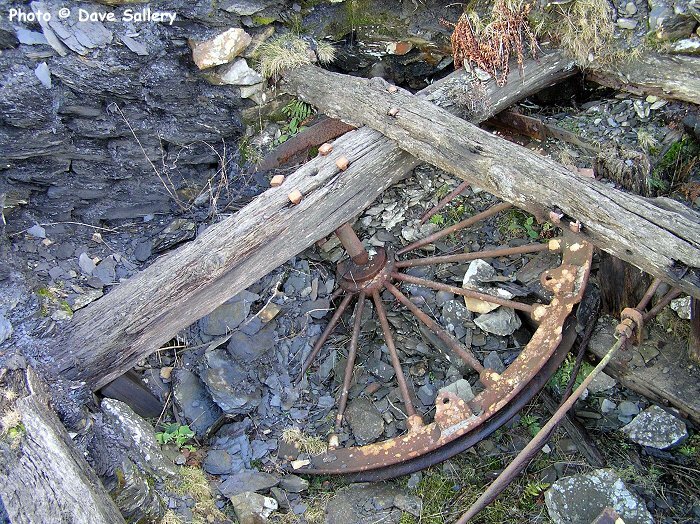 The incline drum from one of the Vivian quarry table inclines at Dinorwic.